Elevating the social lives of TALL People in the Northwest since 1955! The Portland Skyliners Tall Club was founded in September 1955 and incorporated in 1957 for the purpose of promoting friendship and good fellowship among tall people and to sponsor activities of interest to all. The Portland Skyliners Tall Club is a member club of Tall Clubs International™ (TCI) which was founded in May 1938. There are over 40 TCI-affiliated clubs across the United States and Canada as well as many clubs in Europe. Members of local chapters attend TCI Weekends hosted by clubs across the country. ﻿Minimum height: men 6’2”/women 5’10” or TALLer! Proudy representing the Portland Skyliners in all the best parades! Miss Tall Portland 2018 Sheryl Lutz and Mr. Tall Portland 2018 Merrill Jensen. 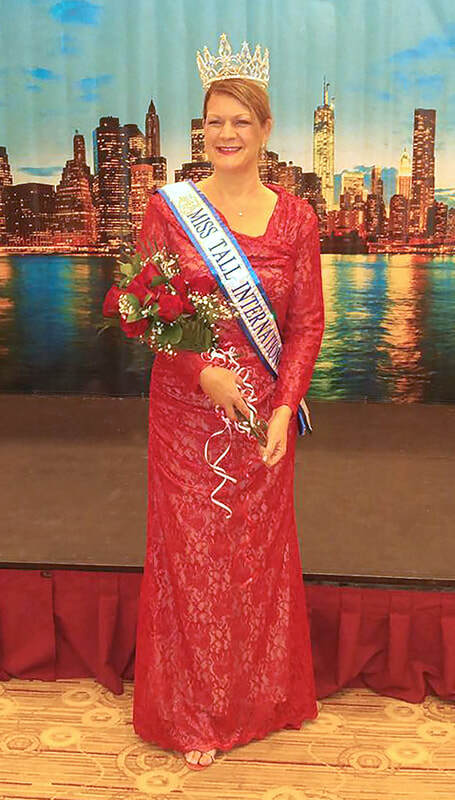 Miss Tall International® 2018 our very own Sheryl Kay Lutz! Click to download PRESS RELEASE! ​all started—in sunny southern California. Flyer and details to follow! Members-Only Section—You must login with password to view items in this section. ​ Our clubs hot news page! Last post to SKYLINES was on April 16, 2019! Check it out! The Portland Skyliners Tall Club is proud to support the Marfan Foundation.